You can attain multimedia cabling support for the MOD HUB Series of active hubs by using the EXP Series of expansion modules. Coaxial cable, twisted-pair wire, and glass fiber optic cable can all operate on the same network by selecting the appropriate expansion modules. Each expansion module accommodates from two to four ports with each port designed to support a specific cable technology. Port transceivers are indicated by a suffix designation (e.g., -FOG) which follows the EXP model number. Certain expansion modules mix two cable technologies within one module, reducing costs in certain applications. While power is off, expansion modules can be inserted into empty slots in any hub within the MOD HUB Series without regard for power consumption. Cabling technologies can be freely mixed-offering great flexibility in configuring hub, media converter and repeater applications. Expansion modules are fastened using thumb screws and can be installed in the field. Each port has an LED to indicate network activity. 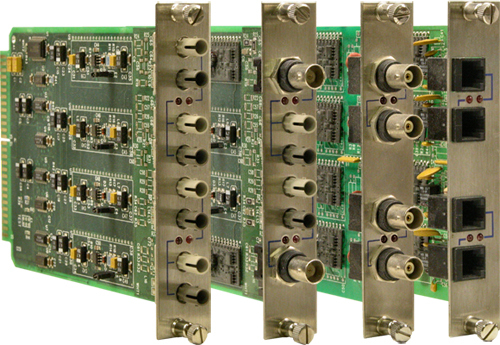 These modules support bus, star and distributed star topologies (daisy-chained nodes, node-to-hub and hub-to-hub connections). Can't find a particular model? Please visit our EXP legacy page.